"I am kicking myself over my own stupidty," Stone told the judge. A federal judge on Thursday slapped a full gag order on Roger Stone, just days after the longtime political operative and adviser to President Donald Trump posted an inflammatory image on Instagram that appeared to target her. Judge Amy Berman Jackson said the posting had a "sinister message" and ordered Stone from speaking publicly about his case. The image Stone posted to his 45,000 Instagram followers featured a photograph of Jackson with what appeared to be crosshairs in the upper left corner. A caption characterized Jackson as “an Obama appointed Judge who dismissed the Benghazi charges again Hillary Clinton and incarcerated Paul Manafort prior to his conviction for any crime." 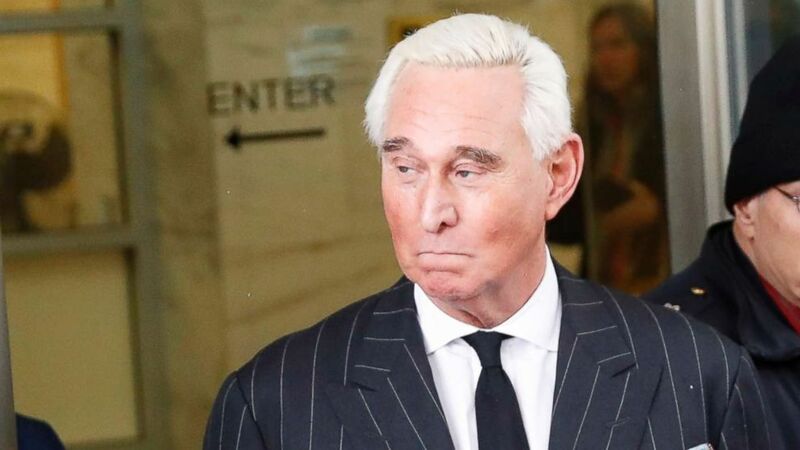 At Thursday’s hearing, Stone, who has apologized both publicly and in court documents, sought to take responsibility for the content of the post but maintained he did not select the image. "I am kicking myself over my own stupidity, though not more than my wife was kicking me. I offer no excuse for it, no justification,” Stone told the judge. "This is just a stupid lack of judgment." "So, no, Mr. Stone, I am not giving you another a chance. I have serious doubts about whether you have learned any lesson at all," the judge said. 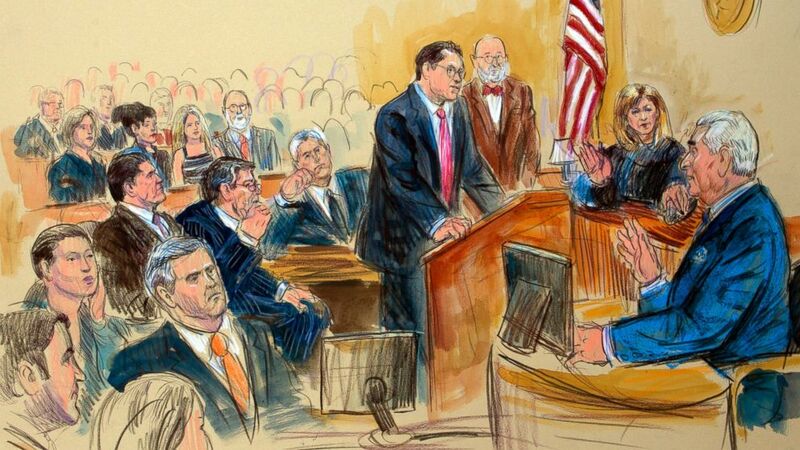 “From this moment on the defendant may not speak publicly about the case." Earlier, Jackson grilled Stone about his decision to post the image, questioning why he could not have selected an image without crosshairs. "It is your Instagram. So, it's fair to say you are 100 percent responsible for what gets posted on it and not anybody else,” she said. "Do you know how to do a Google search? And do the volunteers who work for you know how to do a Google search? How hard was it for you to select a photo that did not have a crosshairs in the corner?" (Pablo Martinez Monsivais/AP) Former campaign adviser for President Donald Trump, Roger Stone, leaves federal court in Washington,D.C., Feb. 1, 2019. Stone fielded questions under oath from both prosecutors and the judge for more than 30 minutes, struggling to explain the logistics of who selected the image that appeared on his Instagram page. He insisted that what the judge and prosecutors perceived as crosshairs was actually a “Celtic symbol,” but he could not identify which of his aides selected the image. "It's a revolving situation," Stone said, unable to name the person he claimed gave it to him. "It has been a whirlwind, sir. I would have to go back and examine it. I would have to go back and think about who was there." Last week, Jackson issued a “narrowly tailored” gag order on prosecutors and witnesses involved in Stone's case but left Stone to continue speaking publicly about the probe -- as long as he refrained from doing so near the federal courthouse in Washington, D.C.
"Every time the defendant gave another one of those interviews he continued to amplify the media coverage and increase the risk to the jury pool," Kravis said. Stone’s defense team counsel, Bruce Rogow, sought a second chance for his client. 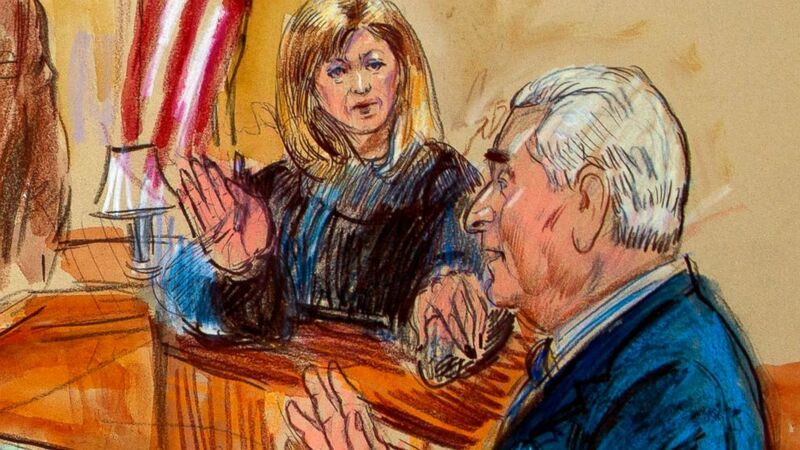 (Dana Verkouteren via AP) This courtroom sketch shows former campaign adviser for President Donald Trump, Roger Stone talking from the witness stand as Judge Amy Berman Jackson listens during a court hearing at the U.S. District Courthouse in Washington, Thursday, Feb. 21, 2019. "What [Stone] is really asking for is a second chance. It should not have been done. It is indefensible," Rogow said. Special counsel Robert Mueller indicted Stone in January on five counts of lying to Congress, as well as witness tampering, and obstruction of justice as part of Mueller's probe into possible collusion between the Trump campaign and Russian meddlers in the 2016 presidential campaign. Stone, who has pleaded not guilty to all seven counts, could face further restrictions. Before adjourning Thursday’s hearing, Judge Jackson left Stone with a stark warning: one more mistake and you may find yourself in jail. "What all this means, Mr. Stone, is that violation of this order will be a basis for revoking your bond and detaining you pending trial," she said. "Today, I gave you a second chance. But this is not baseball -- I will not give you a third chance."